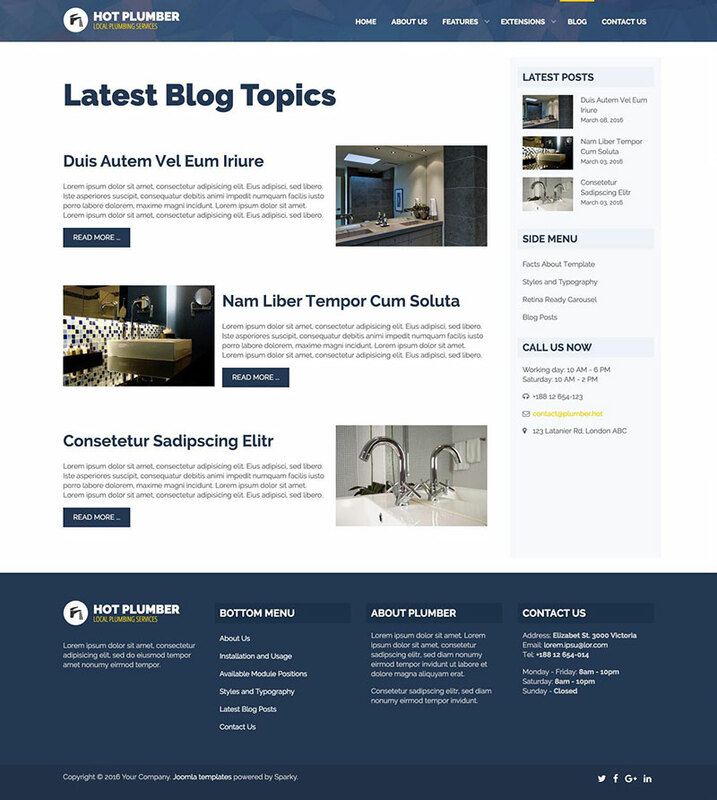 Plumbing template is a responsive business Joomla template for appropriate for small and medium business websites. 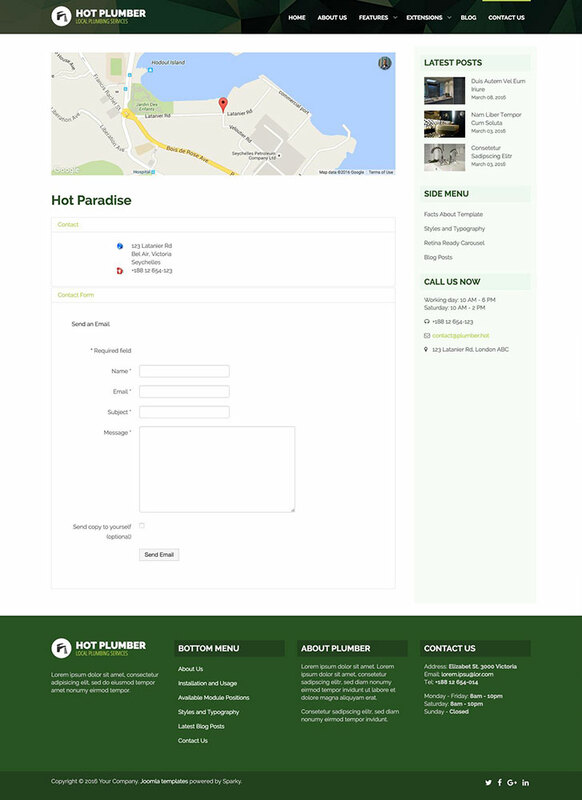 Demo of this template is has plumbing services in its focus, but you can use this template for different kinds of services as well. 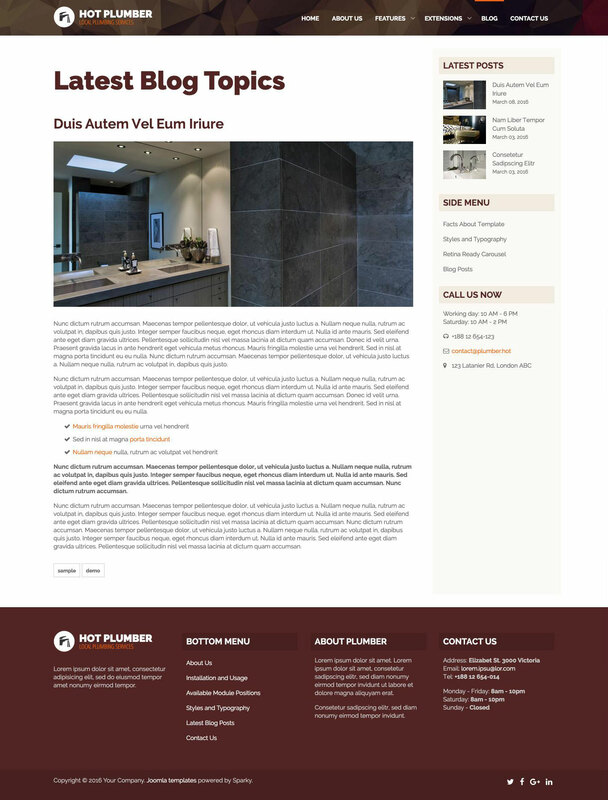 People, in this case, plumbers are the heroes of this design and their retina ready images are placed in a dominant position of the home page. Of course, it won't be too difficult to change a plumber with a carpenter or a mason. This template is based on the latest version of our Sparky Framework which has many improvements in the code. Plumbing template also includes the latest Hot Swipe Carousel with images both in background and slide content (transparent images of workers). This module is now retina ready and it allows you to display different images for double density (retina) screens and regular screens. This is supported for both background and content images. CSS3 based animations are supported in all modern browsers and powered by user's graphics hardware. These animations play smoothly and nicely on screen. 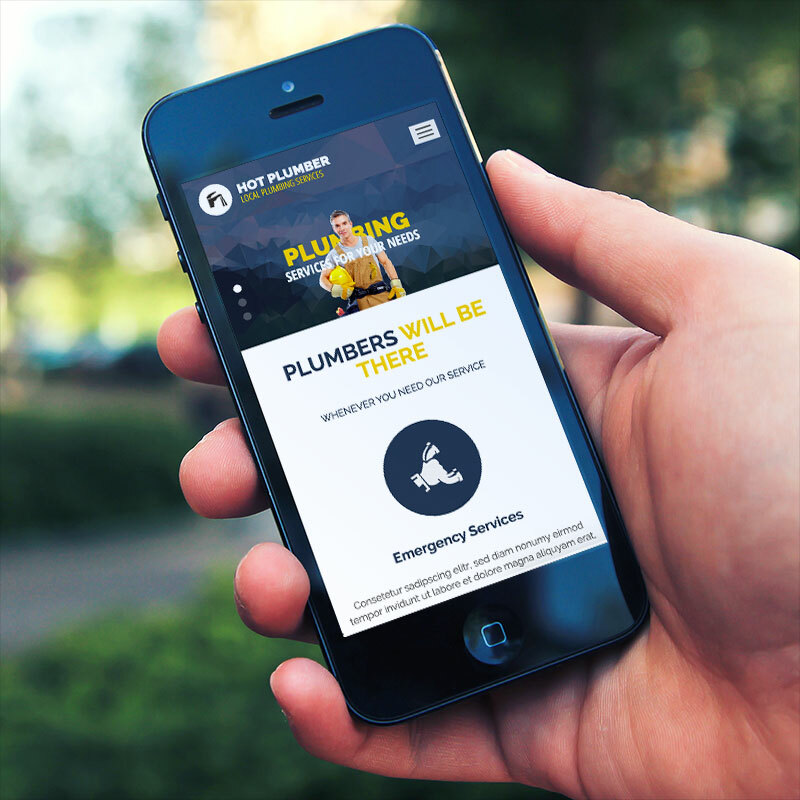 Therefore, we included many CSS3 animations in the Plumbing template. Responsive lightbox image gallery and responsive counters are also included in this template. These modules will help you to include some images and facts about your business in an interesting and interactive way. Last but not least, our framework now allows you to easily maintain two different versions of all images for your articles and custom modules. Just make sure that Retina Images plugin (a part of Sparky) is enabled in Plugin Manager. Beside each regular image (in example image.jpg), upload additional high resolution image and name it properly (in example image-2x.jpg). Our plugin will show appropriate image on both regular and retina screens using srcset property introduced in HTML5. We included several responsive Joomla modules with this template. Hot Swipe Carousel (retina ready), Hot Slicebox, Hot Responsive Lightbox, Hot Maps and Hot Counters module. All these modules are included with this template without additional fees (you save $15 per commercial module). Total control of all menus through the framework. You can set functionalities and style of all your menus and drop them directly into the layout. Top menu with drop-down sub-levels is included. The top menu is converted to a button for easier navigation on the mobile devices.